Hindenburg — German Tier X cruiser. The ship was developed from a series of German heavy cruisers. Unlike ships of preceding classes, she boasted an increased displacement and more powerful main battery guns. Settling in to play Hindenburg at Tier X will feel good to veterans of the branch who took the time to play the previous tier's Roon and get comfortable in her. Hindenburg is essentially a better Roon, with more guns, more torpedoes, more anti-aircraft defenses, and more health. Sporting more main battery rifles than all other Tier X cruisers save the Japanese Zao, Hindenburg is gifted with a balanced 4x3 turret layout: turrets "Anton" and "Bruno" are forward of the superstructure, while "Caesar" and "Dora" are aft of it. This gives Hindenburg captains the flexibility to put all twelve barrels on a single target as necessary, or to present enemies with a significantly narrower profile to shoot and still keep half her main battery in action. Combined with her rate of fire, this makes Hindenburg a potentially deadly opponent to almost any ship she faces. While her individual high explosive shell performance looks uninspiring, it is deceptive; she fires a dozen, highly accurate shells every eleven seconds. They produce a prodigious number of fires and rack up solid penetration damage thanks to German HE shells penetrating enemy armor thicknesses 1/4 of their diameter and below (as opposed to other cruisers' 1/6th diameter and below). Enemy ships who make the mistake of presenting a broadside profile to Hindenburg should be prepared to pay the price; her armor piercing shells have good penetration values and extremely high damage. Salvos of 10,000 damage or more against enemy battleships at mid-range or closer are not uncommon if they opt to disrespect the power of Hindenburg’s AP rounds. Aside from her damage output, Hindenburg is a virtual Swiss Army knife of tools that allow her to contribute to her team's success in other ways. Her anti-aircraft suite is solid; captains who opt for an Anti-Aircraft Build and find themselves facing off against an enemy aircraft carrier are sure to watch enemy planes fall from the sky with glee. She is fairly robust, with an armor scheme that leaves her vulnerable at long range, but able to take more punishment than might be expected as she closes with the enemy; her Repair Party ( ) furthers her longevity. Her torpedo armament packs a serious wallop: Hindenburg loves to brawl with her enemies when given the chance, and her torpedoes frequently mean that she is the one sailing away afterwards, even from a point-blank engagement with an enemy battleship. Last — but not least — she can equip the best Hydroacoustic Search ( ) in the game, capable of spotting incoming torpedoes more than four kilometers away, and detecting enemy ships at nearly six kilometers. On the downside, Hindenburg has a staggering base detection radius of more than 16 kilometers; even when fully-rigged for stealth, the lowest detection radius she can achieve is 12.3 km. This is noteworthy in that there are some Tier X battleships capable of fitting out with an even lower detection radius. Further compounding her detectability issues is her armor scheme's vulnerability to long-range plunging fire. Shells landing on her deck from directly above (or nearly so) will easily penetrate her thin deck armor and cause extreme damage. Hindenburg is most vulnerable to large amounts of incoming damage when at long range. She shines brightest in mid- and short-range engagements, but may struggle to get into those on occasion given her slow top speed (worst among Tier X cruisers) and high detection. Viewed as a complete package, Hindenburg is the epitome of what a Tier X cruiser should be: she doesn't excel at any one thing, but does enough things well that she is capable of contributing to her team in any situation she might find herself in. Game after game, Hindenburg will provide her captain all the tools they need to win; it's up to that captain to employ those tools correctly to ensure victory. Fast-reloading 203mm guns; not as fast as Des Moines, but with better base range and shell arcs. Excellent shell velocity and low gun arc makes hitting distant targets easier. Good range on her main battery guns, which can be boosted to 20.7 km by equipping Gun Fire Control System Modification 2 ( ). One of the highest damage cruiser armor piercing shells in the game; Hindenburg will punish any ship that is completely broadside to her, regardless of class. Strong AA armament, especially if a few modules or commander skill points are invested in maximizing the range. Decent torpedoes with good firing arcs. Armor scheme is deceptively sturdy; she is hard to citadel at medium and short range. Best Hydroacoustic Search ( ) in the game. Armor piercing shells are near useless against targets that are well-angled. High explosive shell damage is lower than all other Tier X cruisers. Sluggish maneuverability and low maximum speed. Large size; Hindenburg is fairly easy for enemies to hit. Large detection radius for a cruiser — 16.0 km base — although this can be reduced to ~12 km with the right equipment modules and commander skills. Prone to citadel penetrations at long range, which makes her large detection radius a huge liability. Has to expose quite a bit of her broadside to bring all guns to bear. As a Tier X ship, Hindenburg has no additional modules to research. As the pinnacle of the German cruiser line, Hindenburg offers more flexibility to her captain than any other top-tier cruiser in the game. She can be fitted out as an anti-aircraft platform rivaling that of Des Moines; she can boost her main battery range and rain shells on opponents from positions that make her difficult to hit; she can boost the rate of fire of her main battery significantly and turn her into one of the best damage dealers in the game. All of these options — and more — are available to Hindenburg captains, depending on which upgrades and commander skills they choose. Slot 6 is one of the primary determining factors in how Hindenburg will play. Her main battery can be fitted out for either maximum range with Gun Fire Control System Modification 2 ( ), or for maximum rate of fire with Main Battery Modification 3. Neither option is bad, though with a stock range of 17.8 km, the likelihood of hitting targets more than 20 km out with her shells is somewhat questionable. Most players opt for Main Battery Modification 3, lowering the reload time on her 203mm guns to a base of 9.7 seconds (which can be further improved with the Adrenaline Rush commander skill). Hindenburg’s best-in-game Hydroacoustic Search ( ) is one of her strengths; the premium version is highly recommended for the reduced cooldown. It allows her to hunt down destroyers in close proximity — particularly those shielded by smoke — and to warn friendly captains of incoming torpedoes in more than ample time to avoid them. Due to the rarity of carriers in high tier games, it is generally preferable to Defensive AA Fire ( ), although the odd carrier might ruin a match. Repair Party II ( ) is also recommended for the quicker cool down and extra charge; Hindenburg’s detectability radius means that she may come under concentrated fire from the enemy team. Quicker access to her health regeneration ability will improve her survivability greatly. 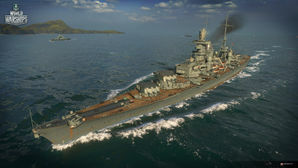 Players who wish to spend doubloons can equip Hindenburg with Type 20 camouflage that lowers her detection radius, reduces the accuracy of incoming shells, reduces her repair costs, increases her credit earnings, and increases the amount of experience she earns. Signals boosting the fire chance of her main battery — Victor Lima ( ) and India X-Ray ( ) — are recommended. India Delta ( ) should be flown to maximize health recovered via Repair Party ( ). Sierra Mike ( ) is a good pick to increase her somewhat low top speed, while November Echo Setteseven ( ) will help pile on more DPS for an Anti-Aircraft Build. India Bravo Terrathree ( ) helps keep her operating costs down. Hindenburg bounces an AP salvo fired by an enemy Des Moines. An enemy Iowa succumbs to Hindenburg torpedoes. Like her predecessor, Hindenburg is a Wargaming-fabricated design made for World of Warships. Wargaming took Krupp's unused drawing of a triple 203mm/56 turret and built the ship around them while taking heavy inspiration from the Admiral Hipper-class cruisers. As a fictitious design, this class was never actually planned and no blueprints exist other than the turrets. Hindenburg shares her name with the Imperial German Derfflinger-class battlecruiser SMS Hindenburg; both are named for Field Marshal Paul von Hindenburg. No ship in the Kriegsmarine was ever named Hindenburg. The plans for the only historical aspect of the Hindenburg, her turrets.